2007 - Nobu & Robert de Niro Opened NOBU In Melbourne | 2008 - Gaston Opens La Mar In San Francisco Next Week! This past weekend I was fortunate to be invited to a couple of Gaston's San Francisco La Mar "Soft Openings". I sampled the cuisine (more liked gorged) and I can tell you this - Gaston's San Francisco Peruvian Cebicheria La Mar is the best seafood restaurant in all of North America!!! I can only imagine what it will be like when they open officially to the general public next week (more details later). If the opening of the much publicized Nobu in Melbourne last year is any indication, La Mar will be just as impressive because Gaston himself will fly up from his world headquarters in Lima, Peru to officially open his flagship cebicheria Peruana LA MAR next week. They have been fine tuning the menu, drinks, service, Cebiche & Pisco bar, wine cellar, staff, and boat taxi services on their own pier with these invite only Soft Openings. Yeah, La Mar will have boat taxi service to its pier from Marin County shortly! Now look at the media press conference reaction when Japan's Nobu Matsuhisa, #1 celebrity Sushi chef in the world; and Hollywood legend Robert De Niro opened NOBU in Melbourne, Australia in 2007. Here is what the reporter said - "De Niro has supported Nobu's style of food for over 20-years, and he believes eating at Nobu is a healthier option then the Italian style of dining." Listen to what Robert de Niro said about Nobu's cuisine - "Nobu's great food is.....a no brainer". Now what has this world famous and accomplished actor been eating over the last 20-years? Well, it is not Italian food. And what is Nobu's cuisine anyway? Well, it is Peruvian-Japanese, Japanese-Peruvian! Nobu was born in Japan, but he lived in Lima, Peru for 4-years in the early 1970s. He opened and operated a successful restaurant specializing in Peruvian-Japanese Cuisine (mixture & influence, not fusion). In the United States, Asia, and Europe, Nobu is the father of modern day "Fusion Cuisine". But this type of cooking has been practiced in Peru for almost 500-years (Spanish conquest of Peru). He repackaged, marketed, fused, and added some Nobu magic to the fine Japanese-Peruvian Nikkei Cuisine. If you ever dine at one of Nobu's very upscale restaurants, restaurant to the A-List stars, in Beverly Hills, New York, or London; you are eating Peruvian influenced Japanese Cuisine! Picture of Nobu in Lima, Peru. Quote from Nobu - "El Peru es mi segundo pais!" Translation: Peru is my second country! If Nobu didn't traveled, lived, and opened a restaurant in Peru, he would not be as famous and rich as he is today. He took the 500-year old Peruvian mixed influenced cuisine outside of Peru mixed it with Japanese style cooking and gave it an international and A-List celebrity following. Now Gaston is taking Peruvian Cuisine to the next level with his army of young Peruvian Le Cordon Bleu graduate chef followers with an ultimate goal - Gaston Wants To Conquer The World With Peruvian Cuisine! Gaston at La Mar in Miraflores, Peru. Bourdain Dined With Gaston At Toshiro's In Lima And Gets Blown Away - Peruvian Nikkei Cuisine! Last year the Travel Channel's Anthony Bourdain returned back to Peru and dined with Gaston at Toshiro's Sushi in Lima. Bourdain gets blown away by Peruvian Nikkei Cuisine! As you can see, Gaston speaks a little English and explains the influence that Peruvian Cuisine has on Japanese Cuisine, and visa versa. Especially the culture and cuisine of Peruvian Cebiche. In Peru Cebiche is not just food, they take it very serious - it is culture! 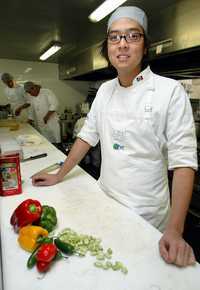 Picture of Diego Oka, La Mar's Master Peruvian Cebiche Chef, in Lima, Peru. I met Diego last week at Gaston's San Francisco La Mar "Soft Opening". He will be the head Cebiche chef at La Mar here in San Francisco. He is young, but looks a lot younger than he really is. In Peru, there is an enormous population of Peruvians with Japanese heritage. Former Peruvian President Fujimori comes to mind. In addition, there is a bigger population of Peruvians with Chinese heritage. Both cultures and culinary styles have influenced modern day Peruvian Cuisine for centuries! In the early 1970s, both Toshiro and the legendary Nobu, #1 celebrity Sushi chef in th world, came from Japan and lived in Peru for several years. They both had success restaurants specializing in "Peruvian Nikkei Cuisine". As you can see, Toshiro stayed in Peru while Nobu exported Japanese-Peruvian Nikkei Cuisine to A-List Hollywood celebrities in Beverly Hills, New York, London, etc.